The HP TouchPad Fire Sale... Was it Worth it? Last week when HP announced both that it was going to sell off its PC division, but also that it was dropping its WebOS devices, the tech community went into shock. This the world's biggest PC manufacturer, with some 26% of the US market or 18% of the PC market worldwide. So far as WebOS goes, this was a stellar mobile operating system that HP acquired when they bought Palm last year. HP said they had big plans for WebOS, announcing new phones running the OS, a couple of tablets running it and even plans to port it to touch-screen PCs in a dual-boot system with Windows. They'd updated the operating system and it was the most anticipated tablet operating system since iOS. All in all things were looking very good for the new upstart. Then HP decided they needed to rid themselves of the devices and so fire sales began. The company reduced the cost of the 16Gb TouchPad down to $99 (£89) and the 32Gb version to $149 (£115). This was amazing considering that the TouchPad reportedly cost $328 to manufacture, $10 more than the iPad 2. So on the face of it, anybody who actually bought a TouchPad in the fire sales was getting a complete bargain, right? Well thousands tried, watching Twitter and the #touchpad hashtag for any word on when the next sale would begin. I spotted that Dixons group, one of the largest electrical suppliers in the UK, was having a sale here on Monday from 6pm so I got online and registered in advance with their website. As to be expected the website crashed and many people failed to get anything. It was a similar story at other retailers, Staples in the UK sold about a thousand more TouchPads than they actually had, and the next day had to phone round customers to cancel the orders. Amazon meanwhile was criticised for delivering cases that people had bought with their TouchPad, while cancelling their order for the TouchPad itself. I was one of the lucky ones, picking up a 32Gb touchpad on Tuesday morning. But questions are now being asked if it's going to be worth it. This is because while HP have announced they will continue to support WebOS, after what I can only call a fiasco, it's entirely possible that all the software developers for the platform will have been frightened away. Indeed Microsoft has been offering free development tools and Windows Phones to all WebOS app developers who want to move to their platform instead. For WebOS to succeed in the future, hardware partners will need to be attracted to produce hardware running the OS. The lack of available apps and a dwindling number of developers, coupled with HP's scare last week over the future of the platform and the uncertainty this brings, will make it extremely difficult, perhaps even impossible, for the company to attract new hardware partners. It's entirely possible that this highly-acclaimed operating system could die here with this tablet. In a way this makes me feel like it's the height of the home computing revolution in the 1980's, something I whitter on about now and again, in that here we've seen a potentially fantastic device and proprietary operating system muscled out by market forces. Back then we lost so much innovation in computers from Sinclair, Commodore and the like that it's hard to put a price on what the actual cost of losing it all might have been. 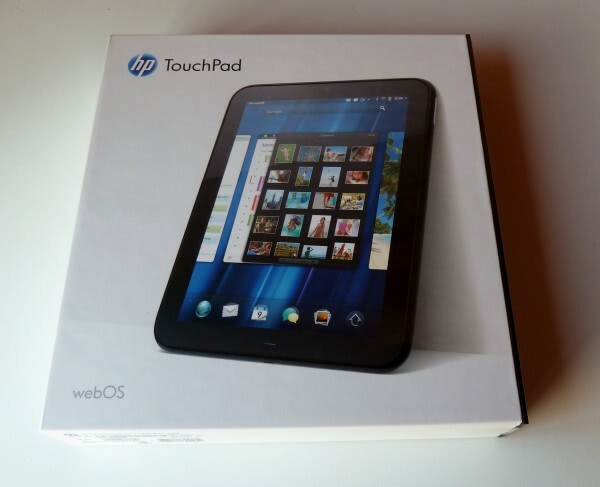 My own WebOS TouchPad has literally just arrived this morning, and as I write this it's still in the box, as you can see in the image above. In the next few days I'll publish a full review of the device here and try to answer the all important question "have people who've bought a fire sale TouchPad wasted their money?" I too will get mine this morning, but with being a member of XDA Developers I am hopeful that within a couple of months there will be a stable port of Android to put on the touchpad, and now the bounty has increased to $2000 for anyone that manages this first there is a race on. And before I have even got it I have found places on the net offering paid software and games for the touchpad for FREE, this is of course an illegal action to obtain copyrighted software and install it for free. I hope HP encourages developers to continue making games and apps for the touchpad as there are so many customers now theres alot of money to be made. according to me it is a complete deal and i still striving hard to get one.. hope i ll succeed in getting one..
Why didn’t they put their PCs on sale too? Why the big rush on just the tablets? There is more going on here than we’re being told. Sadly I don’t think WebOS can handle such uncertainty to be a successful mobile OS. I might be mistaken. I hope I am. The OS is already problematic. I think the TouchPad will not get future updates and improvements, and will soon become another obsolete piece of equipment taking up space in the closet. There may be a small enthusiasts market for a short time. But, the bottom line is, there is no future for the TouchPad. Even at US$149, I’m not so sure it’s such a good deal. There’s a lot of divergent information flying about, so to stay up on news and information on the HP Touchpad, Android on Touchpad and so forth. RootzWiki and XDA have lots of information from tons of “sources” and it’s hard to keep track. So far I’ve found the Facebook page for Android on Touchpad to be most consistent: http://www.facebook.com/AndroidonTouchpad. Just throwing that out there. If they do go ahead and add Android to the Touchpad, this facebook page is a good way to stay up-to-date, in my opinion. The price, for just the hardware, is well worth. A portable DVD player and decent digital picture frame with these specs would run you just as much. Since my main computer broke about two weeks ago, I’ve been putting off getting it fixed. Luckily, with my Touchpad I got on Sunday, I barely have any need for a computer at all! This thing is seriously great for only $99. It’s no iPad, but not much beats a $99 tablet. It will be interesting to see if the buzz about the tablet will last past the sale price hype.